I've always been a big fan of natural fruit rollups and fruit bars and when I found these That's it. bars online, I knew that I must try them. They are made with just fruit! Another thing that I LOVE about this company is that the bars are produced in Walled Lake, MI and I'm from MI. I love local companies. All of the bars are delicious! My favorite it the apple and and apricot flavor followed bu the apple and cherry. Each bar is made with one apple and different amounts of the second fruit. The cherry one for example has 1 apple and 10 cherries in it! They have 100 calories and 3 grams of fiber. They taste like dried fruit and are the perfect snack. I could honestly eat 5 or 10 of these a day if I had them on hand. These taste great and are good for you too. Doesn't get much better than that! Visit the That's it. website and tell me what kind of bar that you want to try the most! -Like That's it. on Facebook (2 entries). -Write on the That's it. Facebook page that The Nutritionist Reviews sent you (1 entry). I'd love to try the Apple + Pear bar! I want to try the Apple + Pears Bar the most. oohh! I want these :) I'd say I mostly want to try the apple and pears variety--sounds interesting. 1 apple + 10 cheeries is the bar I would like to try the most! 2/2 like that's it on Facebook! 2/2 like your Facebook page!! i want to try the apples and cherries bar! I'd love to try the Apples & Apricots. Thank you for this opportunity! My kids would love the apple cherry. I want to try the apple and pear. I most wanna try the Apple + Apricots. Thanks. I'd love to try the Apple and Apricot! The apricot and apple sounds fantastic! I posted on their wall and tagged you. I entered your Pretzel Crisps giveaway. I'd like to try the Apples + Apricots (although I think all three flavors sound good!). I would like to try the Apple + Cherry Bar. I WOULD LIKE TO TRY THE APPLE+PEAR CHEW. I WROTE ON THAT'S IT FB PAGE, THAT YOU SENT ME. I'd like to try the Apples and Cherry bar. I would love to try the apple and and apricot. I would love to try their Apple and Pear bar! I like That's It on Facebook under Kayla P.! 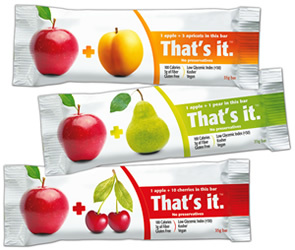 I want to try the Apples + Cherries bar the most. The apple and apricot looks awesome!! I'd like to try apple and apricots flavor - I love apricots but not a big fan of apples and so I am curious how this would taste. Thanks! I want to try the Apples + Pears bar the most. Entered your Pretzel Crisps giveaway. Entered your Seven 'til Midnight giveaway. I would love to try apple and apricot! Entered your Nellos sauce giveaway. I would love to try the apricot! I'd love to try the apricots + apples combination. I entered your Mohawk rug giveaway. I would love to try the Apples + Cherries. Sounds so delicious! I left comment on That's it Facebook wall that you sent me user Lisa Garner.